Chicago Coalition for the Homeless and the City of Chicago partnered up to give 100 homeless families permanent housing, they announced Thursday. 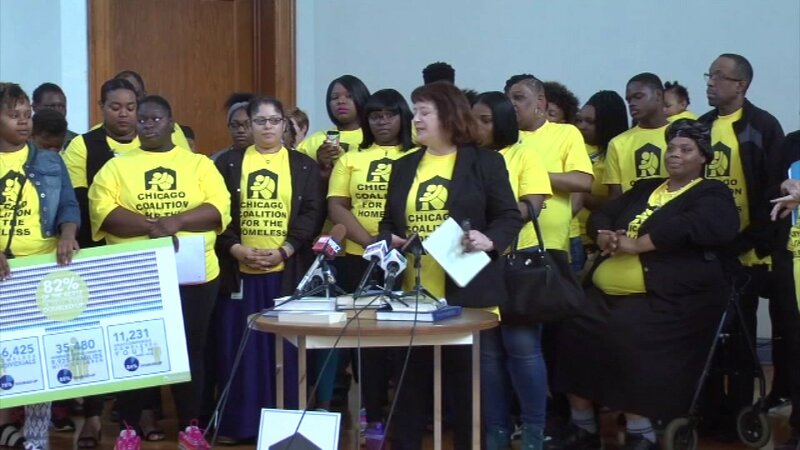 CHICAGO (WLS) -- The Chicago Coalition for the Homeless and the City of Chicago partnered up to give 100 homeless families permanent housing, they announced Thursday. A study showed that the number of homeless in Chicago is much greater than previously estimated because other studies have only counted those without a roof over their heads. CHC is now including those who seek shelter with friends or relatives, a practice known as "doubling up." CHC said more than 67,000 people in Chicago were living doubled up in 2015. This leads to people sleeping on couches or the floor, and children not being able to study in a quiet place, often causing tension to build within the household. Because being doubled up is not considered being homeless, these families do not have access to resources those in shelters do. CHC Policy Director Julie Dworkin said city money coming from $900,000 in AirBNB sales will help pay for the 100 families' relocation, and $1 million dollars from the Chicago Low-Income Housing Trust Fund will also be put to this effort. The 100 families receiving homes are a mix of shelter-based and doubled up families.